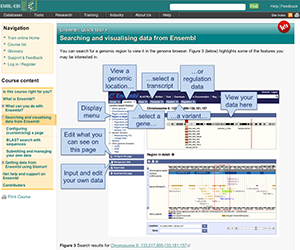 Are you new to Ensembl and want some help on using the browser? 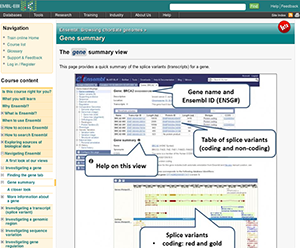 Have you used Ensembl before, and want to learn more about it? Do you want to get data quickly using BioMart? These Online Tutorials are helpful for beginners looking for pointers in browsing their favourite gene, variation or region of interest, or those looking to further develop their skills. The Quick Tour. A good place for beginners, this gives a brief overview of the kinds of data you can find on Ensembl and where to look for it. There are also links throughout to more detailed tutorials. This is only a thirty minute course so don’t expect to be an Ensembl expert at the end of it! The Beginner’s Ensembl Course. This is a good place for beginners, or for Ensembl users wanting to expand their knowledge about the browser. In total, this three-hour overview covers Ensembl genes, variation, comparative genomics, and regulation. You’ll learn where the data comes from and how to access it. Video Tutorials. 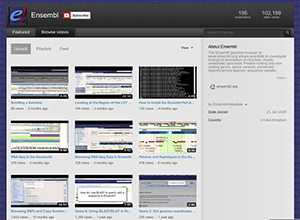 These videos range from 2 minute clips to 20 minute overviews on a particular topic in Ensembl. This is a good place for anyone from beginners to frequent users to increase knowledge and understanding of the wealth of data and resources Ensembl provides. 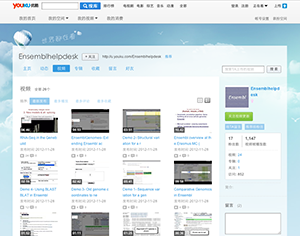 All of our videos are found on our YouTube channel, and our YouKu channel if you’re accessing Ensembl from China. Looking for more? Have a look at our tutorials page. Don’t forget, we run customised browser and API workshops if you want an Ensembl expert to take you first-hand through the site. Can’t find what you’re looking for? Just contact us and let us know! Next Next post: Ensembl 70 has been released!